PERSONALITY- WHO AM I ?? As reported by Kansas City Committee for Skeptical Inquiry, Joyce Jillson (who normally charges $200 per chart) was unwittingly tested by TV reporter, John Stossel in Nov.1988 on his live program Good Morning America. Jillson was supplied with birth information (which was all she requested) and Stossel distributed a copy of the reading she gave to 20 students in adult education class . Each student thinking they were going through their own personalized charts remarked, it was very accurate. By this Stossel declared ,"It is a hustle, and you make money by writing general things everybody believes is about them. "Jana vignana Vedika, a rationalist organisation conducted such a experiment. Everybody is a mixture of both good and bad but in different proportions. Every body can be said to be leader - of the house hold (if he takes his wife's permission to say so! ), the town or even the nation. The main accusation is that the 'personality 'described by astrologer is general in nature and astrologers get through well! 1) The test note, general in nature, was not based on astrological principles. It is not clear whether such note was made by an astrologer or what zodiac sign he was describing! 2) 27 out of 30 students (aged 13 to 16 years!) found the note accurate. 3 out of 30 (10%) students were cool headed and had some better idea of their individuality! The sample survey is small and it does not represent all the segments of the society. 3) Individual views of class IX student should be respected. Yet, it occurs that a simple one time experiment would not be fool-proof to her. She has rather jumped to conclusions in a hurry. 4) Rationalists conduct the same experiments, 'with much the same conclusions' - several hundred times! A boy in his younger days thinks his lines are so perfect and with a bit of practice of 1-2 hours he can excel Picaso. A girl thinks, if that little bit of shrillness is avoided she can be the next Lata Mangeshkar! This power of positive thinking does not electrify their lives as an electric current requires negative charge also! If a bunch of students is taken for such a test, it would be just as the one we came across. Would a matured man not tell the astrologer on the face that the analysis was a buff? Further the character may also undergo changes. Have not we seen people who say they were very bad and changed their life style? Does not one think of his abilities - whether he should take up the managerial job or field work? 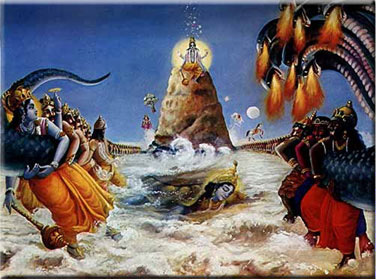 Generally speaking, the person born in Kumbha rasi is philosophic in nature. Does it mean that there are no jail birds born in this sign? Does it mean all Taurus people are employed in Hotels, Night clubs and Banks? Just because we have a leader we can not say he is born in Mesha. He could have been born in any other sign, with influence of kuja, ravi, guru, shukra or shani on rasi or the 10th house. The character analysis is done by a Banker on your loan application with the help of your bank account. The employer desires to know your personality as in the office from the former employer. The perspective father-in-law does many more things-talks to friends of the boy, in the office, his parents and tries to know all the things he wants. So, it is not correct to depend on only rasi for complete analysis of personality. Whenever I see a man counting some 50000 rupees, I am tempted to grab the money and run away! With great difficulty I resist myself - in the fear of being caught and forced to give astrological consultations to my fellow beings in jail! In public speaking, one has to refer to himself that way and address the audience as Maharaj (though the last Maharaj on Air India has also disappeared). You see, that's how I keep my teeth in-tact! One will not grab the cash bag of others though he may wish to, due to the strength of character which is represented by the lagna. So, just like the perspective father-in-law, the astrologer should look into the 2nd house, 10th house, 5th house, lagna, rasi for EXACTNESS of assessing the character and there are no short cut methods. 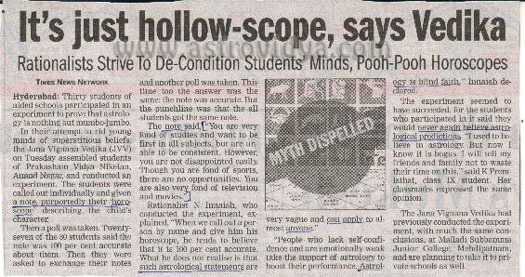 If the predictions given in the news papers do not work for you, do not dismiss astrology. The deduction of personality, or any prediction is an art where every aspect, association, status( like own house, exaltation etc.,) should be taken into account. The human astrologer grows and grows with lessons he perceives every day. But the computer astrologer who works with a click of a button has only artificial intelligence and he never learns! If you take a computer reading of the chart, there is a pit fall. Computer can not relate the results keeping into account the other concepts like Desha, Kala and Patra (nature, time and the capacity) of the client. I do not use any computer software to deduce the results and as such it is not the same computer generated personality analysis. It is not like the 'fit-anybody' sort of ready made garment. THE PERSONALITY ANALYSIS AND PREDICTIONS WOULD BE DONE EXCLUSIVELY FOR YOU. If you are learning astrology or reading a couple of books for curiosity, do not take it for granted that the character described in any of the books would fully reflect you. The medical student in the beginning relates all the symptoms of diseases on themselves and go wrong. So, in case you are interested to learn and experiment then do take up various charts and until you gain sufficient ground DO NOT VENTURE any analysis for yourself or your family members. One more important thing is that do not try to learn the divine subject for the sake of material gains like influence or to gain a way to others' hearts. Money may come or may not. Most of the astrologers are not rich! There should be study for the sake of knowledge only. The description given below are based on rasi (moon sign). Rasi is the position of moon in nirayana horoscope. The portrayal would be prominent if moon is in the middle of the sign and is subject to change depending on influence of other planets. Yet, as the quality of canvas can be identified beneath many layers of painting, there is an ingrained personality for each rasi. For complete assessment of your character, future trends, suitable gem stones etc., an individual evaluation of the horoscope is desirable.